I’m all for enhancing the user experience with non-text content, but only if it makes strategic sense. And only if there’s a solid maintenance plan in place. Because publishing non-text content comes with a set of unique challenges. Anyone with a computer can edit a text file, regardless of its source. By contrast, editing audio, video, and Flash-based elements requires access to the original files and the sophisticated software used to create them. To complicate matters, content producers often choose to host their content on third-party platforms. Third-party video hosting services (e.g., YouTube) attract content producers by offering APIs, advanced embedding features, HD quality, and free bandwidth. Using such providers may streamline your process initially, but also requires handing over a certain amount of control. (Companies get acquired, business plans evolve, etc.) If a change is made to the initial agreement, the API, or even the display/delivery of your content, you may be forced to take your content elsewhere. Concerns about hosting problems can be easily mitigated by retaining those high-resolution versions and their attendant metadata. With those in hand, upload to other suitable hosting services will be a snap. 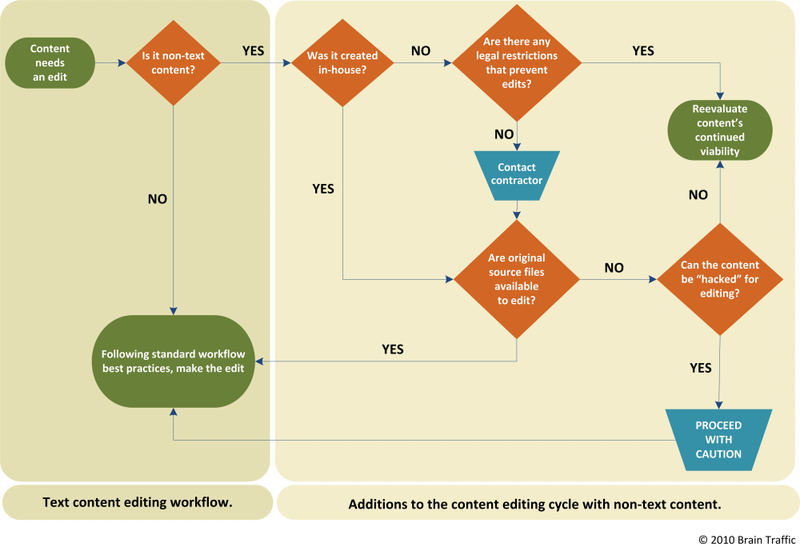 Incorporating these guidelines into your site maintenance plan will help ensure your non-text content is working as hard as it can to keep users engaged and coming back for more.